I absolutely love creating easy recipes for busy moms. 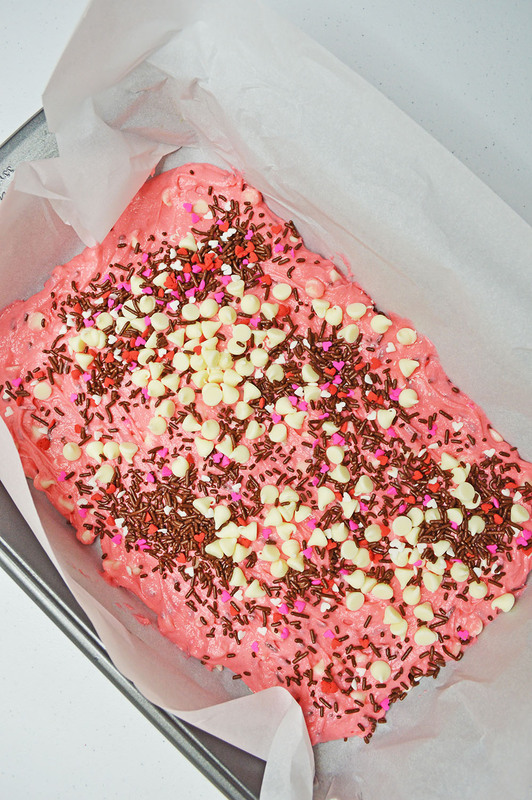 These Valentine’s Cake Mix Bars are just that, and oh so delicious! I absolutely love creating easy recipes for busy moms. 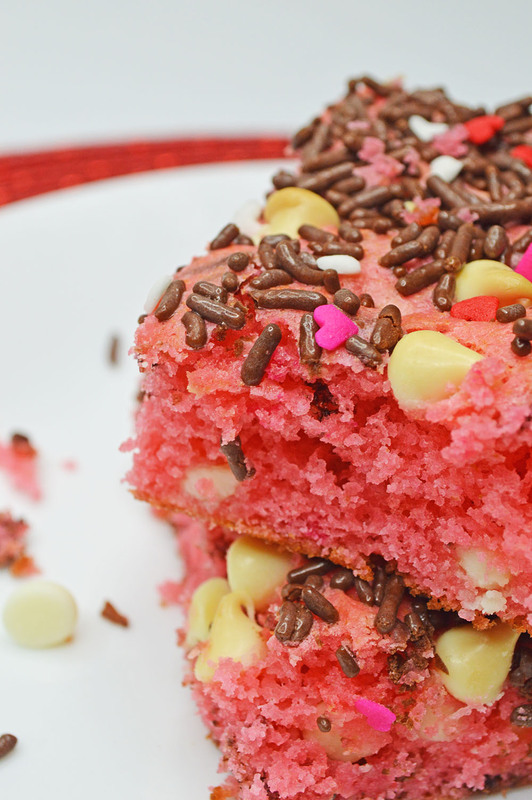 These Valentine's Cake Mix Bars are just that, and oh so delicious! Preheat your oven to 350 degrees. Line a 9 x 13 inch pan with parchment paper. 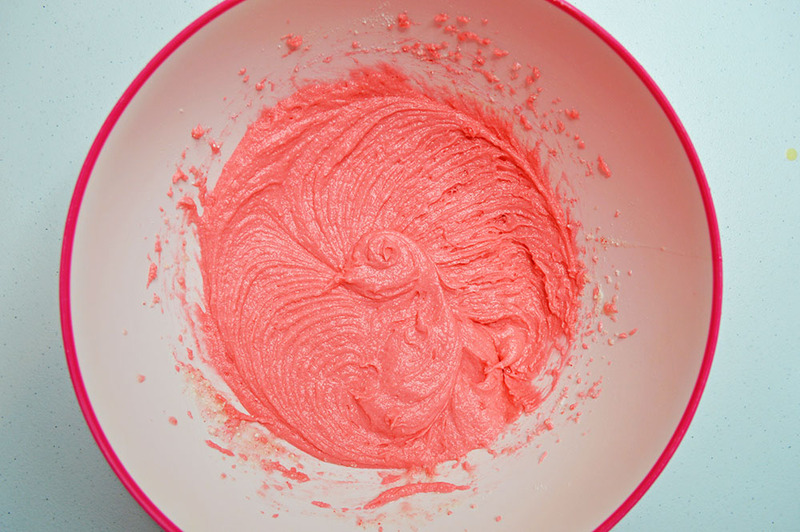 in a large bowl, mix together pink velvet cake mix, milk, oil, and egg. 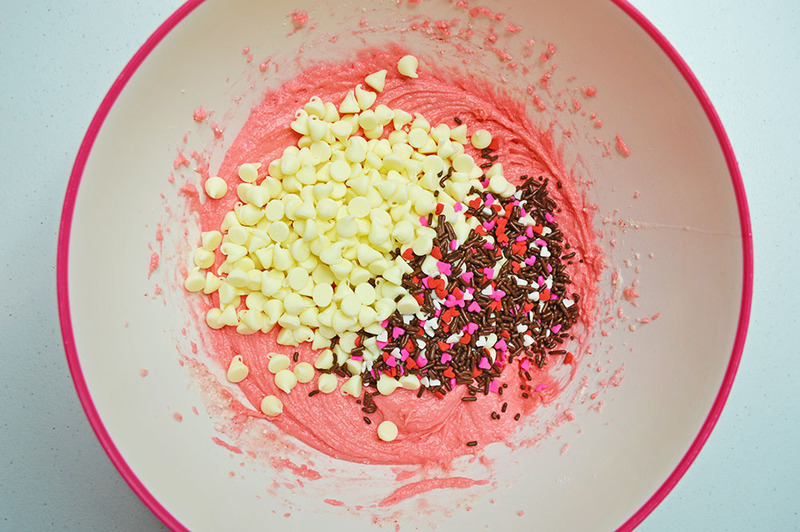 Then, stir in half of the white chocolate chips and half of the sprinkles. Sprinkle the remaining chocolate chips and sprinkle over the top of the mixture. Bake in a 350 degree oven for 20-25 minutes. Cool and enjoy! 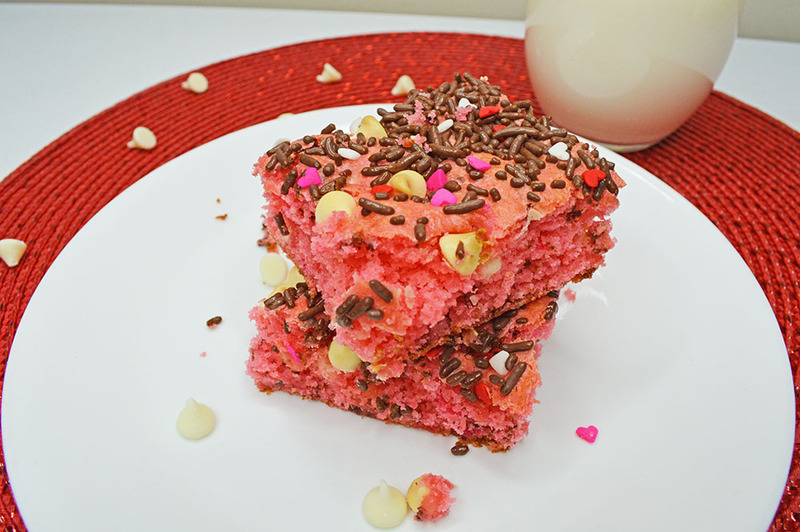 These Valentine Cake Bars are perfect for Valentine’s Day parties at school or with other friends. Thank you for sharing your recipe. It looks delicious and it looks super moist. May have to give it a try. I love using cake mix for different desserts! 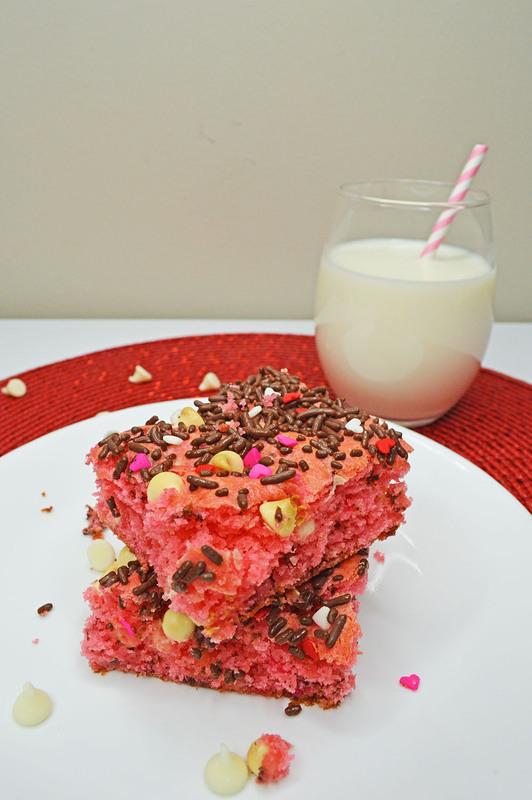 I need to try this… I want to make a Valentine’s Day themed dinner for my hubby and kids & I think they would love this! Maybe they would even want to help make it since it doesn’t look too complicated. I am so making these for my family! My boys will love these as an after school snack. Man these look cute. This would be kind of fun to make for my kiddos class. You know something different than just candy! These cake bars are adorable! My kids would have a blast adding all of the sprinkles too, I definitely think we will be making these very soon. 🙂 Thank you so much for sharing! This is such a cute idea! And bonus: I always love recipes that require little ingredient gathering on my end! These cake mix bars look delicious. I have a sweet tooth so I would be all over these! these are so pretty – I think they would be such a sweet and loving way for my kids and I to bond in the kitchen and we could wrap them up and give them out to their friends! 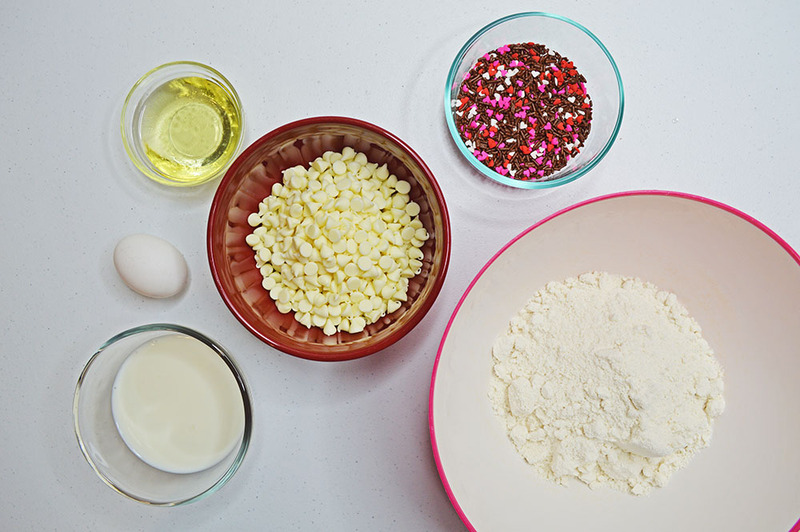 I can definitely appreciate an easy and delicious cake mix recipe. This would be so perfect for a children’s Valentine’s Day party. These look really good! I think I would enjoy making cake bars! those are absolutely adorable. Not to mention, a super easy idea for a school treat for the holiday. These look delicious. What a perfect Valentine’s treat too. I think I’ll make these with my girls. They love helping out with treats. These look so darn good! It has been so long since I have baked something yummy like this! What a yummy tasty Valentine’s treat! I need to make this with my kids they would love it! These are almost too pretty to eat! 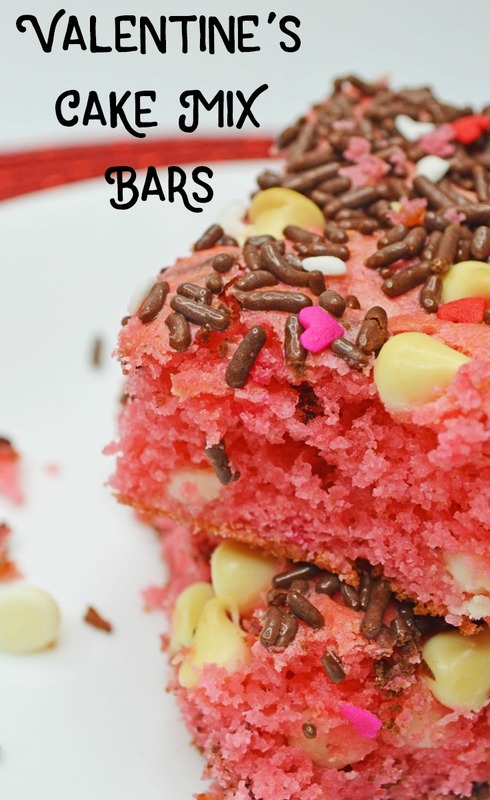 I love pink/red velvet cake and I bet my boys would love these, too! They’d be a quick and easy Valentine treat for their friends and classrooms! What a fun treat for Valentine’s Day! My kids would go nuts for this! These look delicious. And so pretty. Yum! These are some delicious looking bars. I love that they are in bars, making it easier for teachers to serve in class. What a fun cake for Valentine’s Day! I will definitely try this! 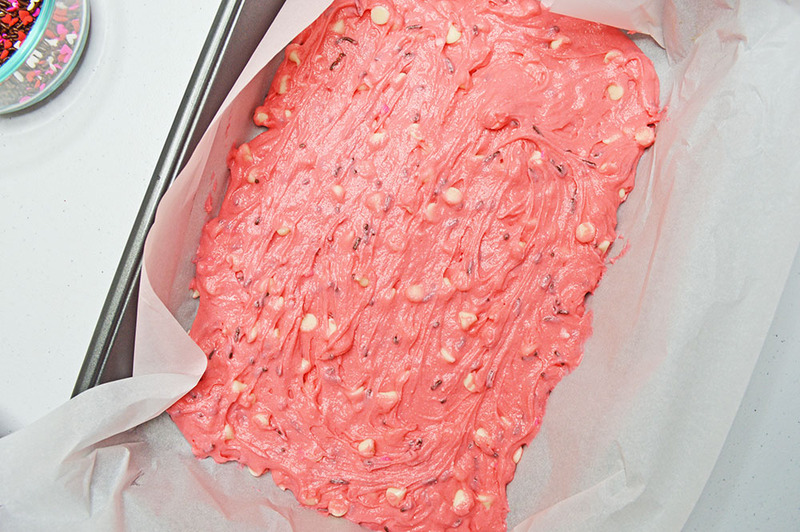 Your Valentines Day Cake Mix Bars look so good. 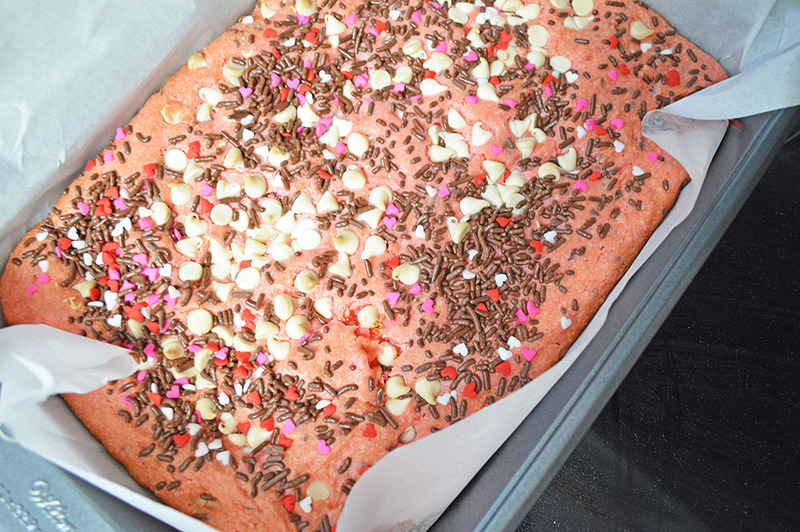 I love the look of the Pink cake and the Chocolate Sprinkles. Perfect For the Occasion! Thank You for sharing you Valentine’s Treat..
i host Bunco in February, and these would be perfect! Valentine’s theme, of course! That looks so good and so moist. Love the color it turned out too. I’ve made cake mix cookies but I’ve never heard of cake mix bars. These sound yummy!